Porter took off for France this Christmas, so I took time off work and poured myself into painting...portraits AND (incredibly high, perilous) walls and got a new bedroom and a little art collection to go inside it. In my years since college, I've fallen in love with watercolor, mainly because it somewhat frees you from the pre-mixing constraints of oils. By working with water, layer after translucent layer are applied and eventually reveal the image. And oh, the thrill of adding in the dark shadows! All the fun lies there. 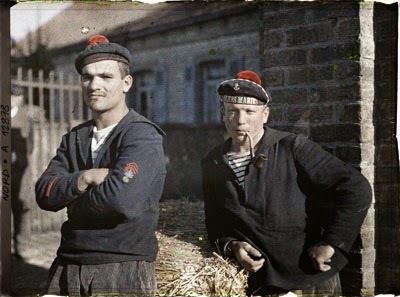 I thought it would be fun to reach into Albert Kahn's wonderful archive of early 20th century photos and found this of two boys in the Fusilier Marins who were charged with protecting the French Naval base at Dunkirk. I focused on the boy to the right and attempted to loosen up and paint fast (two things with which I totally struggle). I love those red pom poms and his pipe.